Die Definition von LUXUS! En Soleil ist die neueste Wohnanlage in Panama City Beach und die opulenteste. Diese Wohnanlage bietet alles, was Sie in Strandnähe suchen. Parken Sie unter dem Gebäude, um Ihr Fahrzeug zu schützen, und fahren Sie mit dem Aufzug zu Ihren Traumunterkünften. Sie finden nur drei Eigentumswohnungen pro Etage und Ihre Eigentumswohnung luxuriös eingerichtet mit edlen Möbeln und allem Komfort. Genießen Sie vom Balkon, vom Wohnzimmer oder vom Schlafzimmer aus einen ungehinderten Blick auf jeden Sonnenuntergang. Entspannen Sie sich nach Sonnenuntergang bei einem der vier Fernseher mit Kabelfernsehen oder werfen Sie eine DVD in einen der drei DVD-Player. Mit vier Fernsehern kann jeder etwas zum Anschauen finden. Bereiten Sie auf den Granit-Arbeitsplatten Gourmetgerichte zu. Verwenden Sie dazu hochmoderne Edelstahlgeräte, darunter einen Konvektions- / Mikrowellenherd, einen Kühlschrank mit einem Wasserspender und einen separaten großen Eismaschine. Oder Sie möchten auf den 531 Quadratmeter großen Balkon mit Sommerküche treten. Mindestalter für diese Wohnung ist 26. Die komfortable Belegung beträgt sechs (6) Erwachsene und vier (4) Kinder unter 13 Jahren. Fantastic condo in a wonderful location. We thoroughly enjoyed our stay. Upon arrival the front desk and security were very helpful. The room was spacious and very clean. The view is fantastic and the kids loved the pool. Wow! Where to start. The complex is located on the east end of PCB, which has become the less crowded area. It is clean and well maintained. The manicured landscape is looks nice. 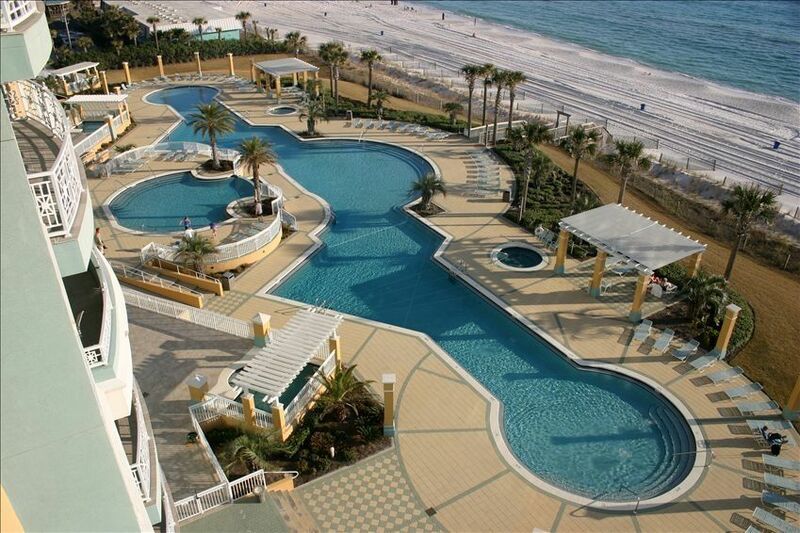 It is a smaller complex compared to others on the beach, which means it is not as crowded. I like the parking garage underneath the complex and the outer parking is still close to the entrances. The pool is very large and the hot tubs are hot and relaxing. Both are cleaned each morning. I really like the security. They are always visible and they make sure that only residents are on site. All of the staff are friendly and do not hesitate to help you if needed. The elevators are quick and clean. All of the floors and carpeted areas are clean and do not have a worn out look. The fitness center is not very large but has treadmills, bikes, elliptical machines, and an all-in-one weight machine. Each floor only has three condo units. Step off the elevator and you are in a carpeted inside foyer area. Each floor has a room for trash and another room full of beach items. Cameras monitor each unit. We stayed in condo 723. This unit was awesome. We had plenty of room for our crew of eight. The kitchen had everything we needed and then some. The bedrooms were comfortable and tastefully decorated and the bathrooms were clean. We loved the full size laundry room complete with sink and cabinets. The living room had plenty of seating and an awesome view of the ocean. The balcony was huge. I loved the gas grill and used it multiple times during our stay. We enjoyed a meal or two around the patio table that seats six. We also spent a lot of time sitting in the four lounge chairs (well, and some nap times). Each unit has remotes for your vehicles so that you can open the front gate when leaving or returning. Instructions for arriving and departing are straight to the point and easy to follow. I highly recommend staying here if you have the opportunity. The condo was nicely decorated, and had an awesome patio with beach, ocean, sunset views! The owners closet contained everything we would need for the beach- umbrellas, noodles, chairs, cart, etc...the kitchen contained all of the tools- crock pot, toaster, coffee maker, pitchers, pots/pans...very well stocked. I am currently staying in this condo and will be returning for a week in September. I travel extensively and never give reviews - positively or negatively however I wanted to write one for this trip. This condo was spotless! The kitchen is stocked with anything you might need and everything works wonderfully. The highlight of this location is the large balcony with six chairs around the table and 4 lounge chairs with a brand new gas grill. The owners have gone out of their way to provide furnishings that are high quality. The "5th bedroom" is actually the master closet that is so large they put a bed in it that is perfect for children or an adult. I appreciate coming here and staying in such a clean, wonderful place. The property is beautiful and maintained. I would suggest anyone choosing this condo - but hopefully not when I am looking to return. Thank you Paula for everything. Janet, We LOVE to hear that we have met or exceeded our customers expectations. Our goal is to have our customers so satisfied that they will return and tell their friends. We have many repeat customers who usually book the next year when they are leaving their current week. We stayed at this condo Jan. and Feb. 2016, the property is as described, if not better. The patio, view and beach are fantastic, the owners are great to work with, I would highly recommend this condo. Gary, we LOVE when our customers are satisfied and our goal is to meet or exceed all expectations. We hope that all our customers are repeat customers. We look forward to having you as our guests again. Rates are subject to change until confirmed. All rates are for rental only! Taxes and cleaning fee and parking fee are not included. Damage deposit is used to secure the reservation and is refundable upon departure as long as everything is left as you found it.